I’ve been rather quiet again recently, however, as coauthor of an article just published in PLOS ONE, I’ve good reason to come out of my shell today. The new paper describes and names the Weymouth Bay Pliosaur, a spectacular almost complete skull over 2m long. As discussed in the open access paper (take a look), the specimen is sufficiently different from all other pliosaurs to warrant a scientific name of its own, Pliosaurus kevani. Pliosaurus kevani was named to honour Kevan Sheehan, the Osmington Mills café owner who collected most of the skull, piece by piece, over a period of eight years. Kevan collected chunks up to 60 kg each as they weathered out from the Jurassic aged Kimmeridge Clay Formation sea-cliff. The specimen was purchased with funding secured by Dorset County Council’s museum service from the Heritage Lottery Fund Collecting Cultures programme, and Dorset and Devon county councils. It was prepared between 2010 and 2011 by Scott Moore-Fay and went on public display in Dorchester County Museum in July 2011. 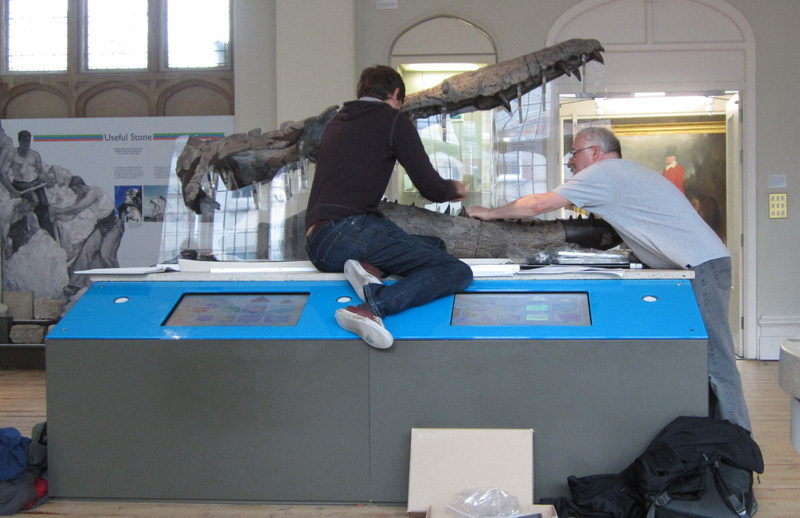 Richard Forrest, who was involved with the project from the beginning, first had the idea of putting together a ‘dream team’ of British plesiosaur specialists to study and describe the skull. This is the first collaboration of its kind among plesiosaur researchers (as far as I know), and I feel lucky to have had the opportunity to contribute to it under the driving force of our lead author, Roger Benson. The massive skull has a long snout, circular orbits, huge temporal openings for the jaw musculature, and a deep mandible. Large portions of the skull have been crushed flat during fossilisation, so one of my tasks was to reconstruct the skull to show how it might have appeared before it was flattened. After several versions and much input from Mark Evans, I’m pleased with how it turned out, and I think we’ve produced a pretty accurate reconstruction of Pliosaurus. On the basis of this reconstruction I’ve also had a go at restoring the life appearance of P. kevani in profile. Despite its large size and massive teeth, the head is rather gracile. Pliosaurus belongs to a group of plesiosaurians known as thalassophonean pliosaurs. 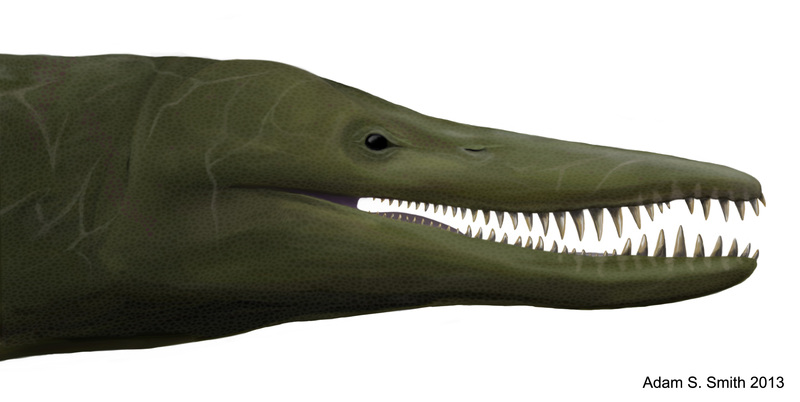 If you haven’t heard of them before, that’s because the name Thalassophonea, or “sea slayers”, was proposed just this year (Benson & Druckenmiller, 2013) for a natural group of derived giant pliosaurids including Pliosaurus, Liopleurodon, and Kronosaurus. Thalassophoneans were macropredators, that is, giant predators doing the sort of dirty work in the Middle-Late Jurassic and Cretaceous that rhomaleosaurids did in the Early Jurassic. The paper also discusses the evolution of pliosaurids. The earliest thalassophoneans have a long mandibular symphysis, but in later members the symphysis becomes shorter. This trend is related to a shift in the dietary habits of pliosaurs from primarily fish-eaters to macropredators. In conjunction with this trend, we demonstrate that pliosaurids tend to follow Cope’s Rule – they get larger throughout their evolutionary history. 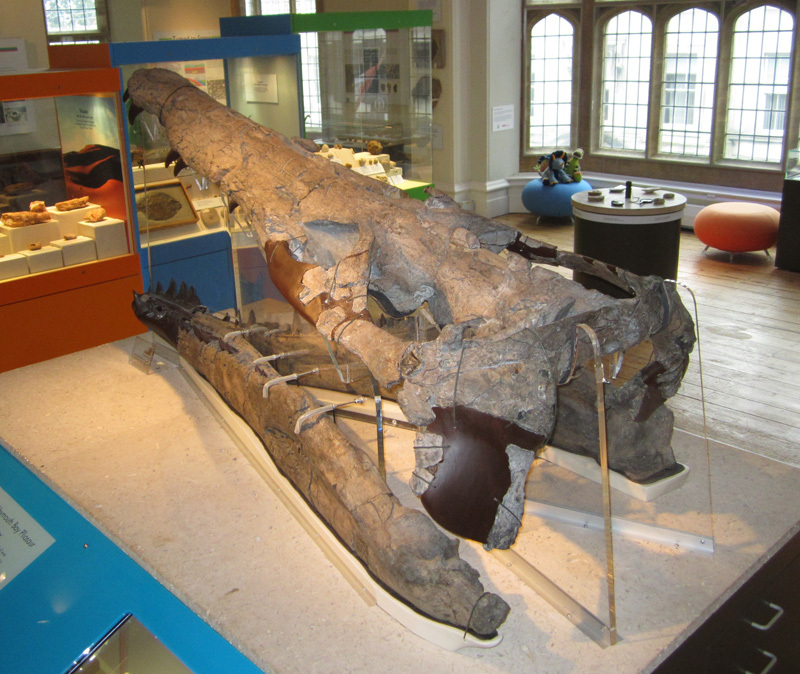 We also name two other new species of Pliosaurus in the paper, P. westburyensis and P. carpenteri, based on material in the Bristol Museum & Art Gallery from Westbury, Wiltshire. Again, there are morphological aspects of these specimens that distinguish them from one another, but don’t justify new genus names. So, add these new species to the existing list of valid Pliosaurus species and we find ourselves with a rather large number of species within a single genus. The others being: P. funkei, also known as Predator X, P. brachydeirus, P. rossicus, and there might be one or two more pending thorough description of the material. Some invalid species of Pliosaurus have recently been sunk too. Future research might show greater generic diversity among these species, but that’s really dependent on the discovery of more satisfactory fossil material. I heard that they did a CT scan of the skull. Was that part of this research paper? No, the details of the CT scans will be presented in a later research paper. I’m just wondering, have you read Colin Mchenry’s paper on Kronosaurus (http://nova.newcastle.edu.au/vital/access/manager/Repository/uon:12164;jsessionid=E168322E81D2E92CD67E75941720B88F?exact=subject%3A%22palaeoecology%22)? His estimates for the size of Kronosaurus seems to differ from your current paper. DinoAstur - » Tres nuevas especies de Pliosaurus !!! Are there evidences (even fragmentary or unpublished) of 80 ft long macropliosaurs ? Hello Adam, your last response is interesting. A future article? Does it mean that >20m pliosaurs could be no myth after all? Glad it deserves an article anyway.